When Michael Hauer decided to buy a home, the 25-year-old looked for something with architectural flair close to his midtown-Phoenix office. In December, he chose a 734-square-foot condo in One Lexington, a high-rise on Central and Lexington avenues. Once called Century Plaza, the steel-and-glass former commercial building went through bankruptcy during the housing collapse, and the new owner cut condo prices by about half. Less than a year after One Lexington restarted sales, more than 70 percent of its 145 units are sold or under contract. Hauer thinks his new home is a good investment at $181,950 plus a $299 monthly HOA fee (based on his unit’s square footage), which he’ll start paying at the end of the year. Such luxury-condo developments, meant to capture buyers wanting an urban lifestyle with access to Metro light rail and Phoenix’s burgeoning restaurant and nightlife scene, are showing signs of life after the housing crisis sent several such properties into bankruptcy. Will Daly, a Phoenix broker who specializes in urban properties and lives in a midtown-Phoenix high-rise, said he’s starting to see an uptick in interest for high-rise and urban-living options. Just down the road from One Lexington at Central Avenue and Palm Lane (just north of the Phoenix Art Museum) is another luxury development that went through months of financial turmoil but is back on the market under new ownership. 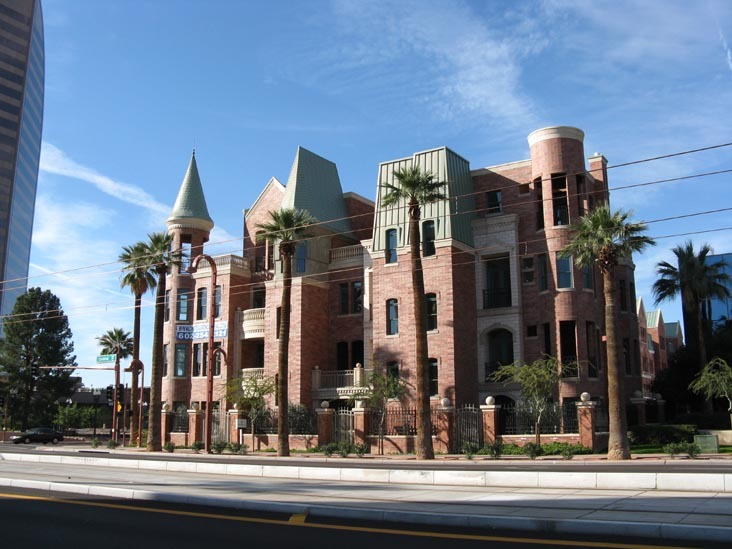 Chateau on Central is a development of 21 luxury townhomes that looks like miniature brick castles, complete with turrets. These Queen Anne Victorian-style townhomes boast 5,200 square feet of living space or more on five floors. The homes went on the market for $1.389 million to $2.459 million in December (plus a $575 monthly HOA fee), when the new developers unveiled two model homes decorated by the Scottsdale design firm Est Est. None of the units has sold yet. Prices are about half of the townhomes’ original asking price of $2.8 million to $4.5 million in 2007. MSI West Investments bought the 21-townhouse development for $7 million last year after its financer, Mortgages Ltd., declared bankruptcy. Each home has four floors plus a basement, a private four-person elevator, a two-car garage, a top-floor terrace and balconies. There are no shared community amenities, such as gyms, swimming pools or cigar clubs, at Chateau. Joe Morales, a real-estate agent with Arizona Great Estates-Realty One Group, said that’s because luxury buyers prize privacy over shared spaces. All the townhomes are zoned as work/live spaces, so buyers could set up professional offices in the basement or on the first floor. Morales said he may seek a light-commercial buyer, such as a high-end restaurant or law firm, for the largest townhome: an 8,252-square-foot corner property on Central Avenue, currently listed at $2.459 million. One Lexington and Chateau on Central are bucking a trend. Other developers are putting rental signs on luxury and high-rise urban properties built during the height of the market and meant to sell as luxury condos. 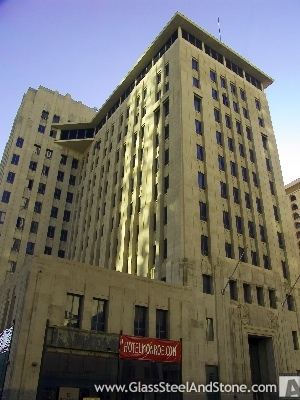 The 44 Monroe building in downtown Phoenix and West Sixth, formerly called Centerpoint in Tempe, are two such properties whose units will be leased rather than sold. Two years ago, Daly, the Phoenix broker, conducted bus tours, taking dozens of urban-living enthusiasts to see high-rises and new condo developments around the Phoenix, Scottsdale and Tempe city centers. The economy put many of those developments, and his tours, on hiatus. Today, Daly said he’s getting more inquiries from out-of-towners looking for investment properties and second homes. And Valley residents are asking when his tours will resume. For Hauer, an architect in training with Gabor Lorant Architects, the clean lines of the contemporary One Lexington building won out over some older downtown high-rise properties he considered. Remaining units at One Lexington (owned by the Macdonald Development Corp.) range from $165,400 to $981,900 for a two-story, 2,846-square-foot penthouse. “The finishes were a big part of it,” Hauer said, listing the Caesarstone countertops, stainless-steel Bosch appliances, bamboo floors and modern kitchen cabinetry. The building’s amenities include a pool, gym, community room, parking and a small dog run, which comes in handy for Hauer’s longhaired Chihuahua, Margarita. Hauer said he also enjoys sitting on his small 14th-floor balcony, looking north over the stunning midtown Phoenix skyline and the distant mountains, reading his iPad. “That’s the icing on the cake,” he said. [Source: Milwaukee Business Journal] — Main Street Ingredients, a La Crosse company that manufactures and distributes food-processing ingredients, has been selected to buy the “opulent” Chateaux on Central brownstone project in Phoenix for $7 million. The unfinished residential development at the northwest corner of Central Avenue and Palm Lane has been financially troubled since construction started in 2005. All forward movement stopped when the lender, Mortgages Ltd., took it back in 2008 shortly before that company was forced into Chapter 11 bankruptcy protection. Mark Winkleman, chief operating officer of ML Manager LLC, said MSI West Investments LLC submitted the winning bid for the Chateaux. Closing on the property is scheduled for Friday. ML Manager is the court-approved entity administering the Mortgages Ltd. loan portfolio in the wake of the lender’s bankruptcy. The Chateaux is one of the first Mortgages Ltd. properties to be sold off. The project was designed as 21 five-story residences with private elevators and rooftop terraces. The announced prices ranged from $2.8 million to $4.5 million per unit, but none were sold. Desert Hills Bank provided the first construction loan, but the relationship soured when the bank filed a lien on the property. The late Scott Coles, then CEO of Mortgages Ltd., stepped in to salvage the project, but Coles committed suicide on June 2, 2008, thrusting the entire Mortgages Ltd. loan and property portfolio into limbo. Within a month of Coles’ death, several borrowers forced Mortgages Ltd. into Chapter 11 bankruptcy. Fraud case ends for Arizona’s Mortgages Ltd.
[Source: Andrew Johnson, Arizona Republic] — The U.S. Securities and Exchange Commission has resolved fraud accusations it brought against an investment arm of failed commercial real-estate financier Mortgages Ltd. The federal agency on Monday announced that Mortgages Ltd. Securities LLC agreed to an order revoking the company’s registration as a securities broker-dealer. The SEC also sought $7.3 million in penalties and prejudgment interest but waived the amount because the investment firm demonstrated a lack of funds to pay. The action stems from the downfall of Phoenix-based Mortgages Ltd., once considered Arizona’s largest private commercial lender. [Source: Jahna Berry, Arizona Republic] — Most of the units in 44 Monroe, the swank, 196-unit luxury high-rise could be headed for foreclosure. The bank has filed a notice of trustee’s sale, the first step toward taking over 182 unsold condos. The units are scheduled to be sold to the highest bidder on April 14, according to county documents. A notice of trustee’s sale doesn’t always end in foreclosure but it’s a signal that the project has serious financial problems. The 44 Monroe owes Corus Construction Venture, LLC $86.8 million, according to county documents. Officials at Grace Communities, the project’s Scottsdale developer, declined to comment on today. The project near 1st Ave. and Monroe St. was completed in 2008. 44 Monroe’s lender collapsed and was taken over last year by the FDIC, which owns a 60 percent stake in Corus Construction Venture, LLC. The rest is of the firm is owned by private equity consortium led by Starwood Capital Group. This is the second upscale high rise in the heart of downtown Phoenix to face financial trouble in recent months. The Summit at Copper Square, a 165-unit condo complex, sought Chapter 11 protection October. The developer headed to bankruptcy court to stop its lender from foreclosing on 74 unsold units. The Summit’s bank, Scottsdale’s Stearns Bank, filed a notice of trustee sale last summer. Notwithstanding the mayor’s optimism, downtown Phoenix faces some economic problems. High-rise condominium developers face questionable financial futures because of troubles with pricing and occupancy. The Hotel Monroe redevelopment at Central Avenue and Monroe Street remains stalled, and the boarded-up building has become a haven for pigeons. The total amount of vacant space in downtown Phoenix stands at 1.05 million square feet — up from 630,400 square feet in the first quarter of 2007, according to Colliers International. The downtown vacancy rate is 13.8 percent, compared with 8.5 percent in first-quarter 2007, according to Colliers. Downtown also is feeling the effects of pulled-back consumer spending. A number of downtown businesses have closed because of the recession, including Weiss Guys Car Wash at Grand Avenue and Van Buren Street and the China Inn restaurant at the Colliers Center. [Source: J. Craig Anderson, Arizona Republic] — Thousands of green-building advocates will travel to Phoenix this month for the industry’s largest annual conference, featuring seminars, networking events and a consumer expo focused on energy efficiency and conservation. Many of the estimated 25,000 attendees and 1,000 exhibitors at the Greenbuild International Conference and Expo, from Nov. 11 to 13 at the Phoenix Convention Center, also will get their first glimpse of sustainability efforts in the desert. The Greenbuild conference will acquaint visitors from around the world with dozens of green-building projects and initiatives in the Valley and across the state. The good news is the homes did turn over. All but two resold — albeit at much lower prices. The Salters have been trying to refinance their mortgage at a lower interest rate for two years and are just now getting their lender, Chase Bank, to come to terms. Still, they are glad they moved. “You know, my kids love it here. I have family here. I have some good friends here,” Salter says. But the pause button has been pushed in Phoenix when it comes to new construction. Grady Gammage Jr., an attorney and a real estate developer, spends a lot of time thinking about his native Phoenix’s future. He says the pause should make the Phoenix area take stock. “We’re now big enough that maybe continuing to operate on a boom and bust cycle as a sort of Wild West frontier town is no longer the right formula, and we ought to try to diversify our economy a little more,” he says. One-third of the jobs lost statewide — 100,000 out of 300,000 — have been in construction. Gammage says it’s time for Phoenix to create employment that can sustain itself through good times and bad. A solar energy industry is one idea for alternative employment given the abundance of sunshine. Instead of the sprawl Phoenix is known for, many local architects and urban planners want more density. Urban nodes, they call them — where working and living can be done close to each other. Phoenix has expanded its downtown business core in recent years — but as in other Western cities, it largely rolls up at night when people drive home to the suburbs. The car is king here. For years it has been the only way to get around. But in December, Phoenix opened its first light-rail system. Two lines connect downtown with outlying areas. Ridership was up to 1 million people a month at one point. [Source: Mike Sunnucks and Jan Buchholz, Phoenix Business Journal] — Some Valley city council members are frustrated with the lack of updates they are getting from real estate developers regarding projects tabled by the market crash and recession. A slew of construction projects have fallen short of expectations, and council members across the Valley are giving developers and their lawyers mixed reviews on keeping their respective cities updated. “No, no, no, no, no,” Tempe City Councilman Ben Arredondo said when asked whether he’s been kept up to date on the status of stalled projects — including the Tempe Centerpoint condo high-rise, which is in Chapter 7 bankruptcy and sits unfinished on Mill Avenue. Arredondo said he’s not getting frequent or detailed enough updates on Centerpoint or other projects. He said developers — especially those in distressed situations, such as Centerpoint — aren’t giving Valley cities straight answers on their projects. “I don’t think they are ever going to give us the bottom line,” Arredondo said. Developers and their various lawyers aren’t specifically obligated to keep cities updated on their projects, but some city council members are worried about the status of delayed or abandoned developments and how they might hurt short- and long-term economic development. Centerpoint developer Ken Losch did not respond to requests for comment. Centerpoint is not the Valley’s only distressed real estate development. The Hotel Monroe redevelopment in downtown Phoenix sits empty and boarded up. Downtown condos such as 44 Monroe and the Summit at Copper Square are mostly empty, and a significant number of suburban subdivisions and commercial developments are unfinished or delayed because of lack of demand and financing. Phoenix Interrupted: Downtown’s full of gleaming progress surrounded by vacant lots – now what?